Paris, April 17: "This is not a time for politics," French President Emmanuel Macron on Tuesday told the nation in a short televised speech in the wake of Notre Dame Cathedral fire, pledging to come out with a response to the "Yellow Vest" movement soon. "I will come back to you as I have been committed in the coming days so that we can act collectively following 'the great debate'," he said. Still struggling to find a way out of the social unrest, the president regretted "the false impatience", saying "tomorrow politics and its turmoil will resume... but the moment has not yet come." Notre Dame Cathedral Fire: Photographer Urges Internet to Find Man and Child Pictured Just Hours Before the Blaze, Tweet Goes Viral. 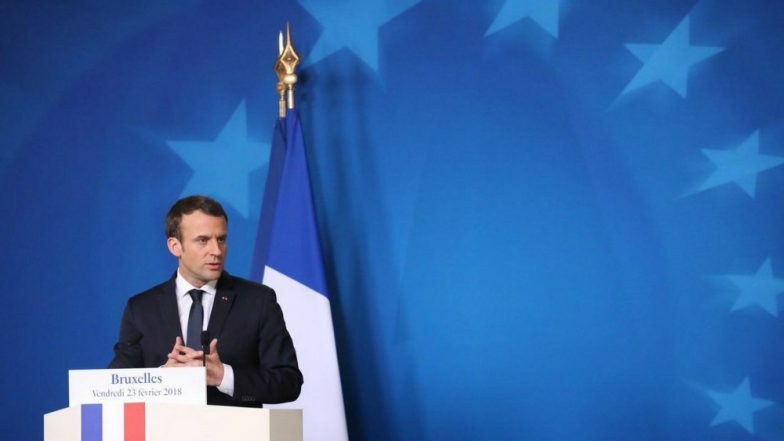 Macron, a former investment banker, had planned to reach out discontent people on Monday evening to unveil decisions he has taken to ease social tension that led his approval ratings to record low, Xinhua reported. However, he had cancelled the speech after a blaze consumed Notre Dame Cathedral's roof and spire, which had brought shock and sorrow to France and the rest of the world. A press conference scheduled on Tuesday was also delayed, according to the presidency office. The "Yellow Vest" movement, a nationwide protest against weak economic performance and stagnant income increase under President Macron, started as a campaign against surge in fuel prices in November 2018. Notre-Dame Cathedral in Paris Goes up in Flames, Know the History And Facts of Famous French Tourist Attraction (Watch Pics and Videos).